These lovely invitations were for a wonderful bride married recently at SMU Perkins Chapel. With Jordan Payne, here planner we worked out the details of getting these addressed from Pittsburgh for her. 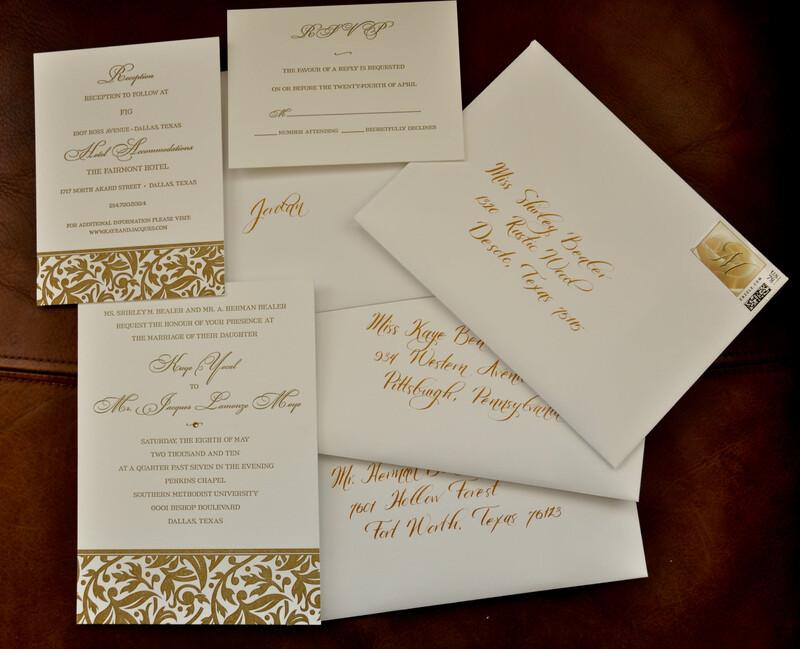 The ink is gold in the kegan font to give a bit of a modern twist on the traditional letterpress invitation. Oh and a lovely custom postage stamp to tie the whole thing together. I finally grabbed a moment to watch my lovely bride Kristen in her wedding video by Joe Simon. Stunning. I was smiling the entire time and then proceeded to watch 5 other videos! Each one making me wistful of my wedding day. That is some amazing work. Anyways – wanted to share this amazing vendor with you all. Beware – it’s easy to watch video after video 🙂 Oh – an do it justice on a computer that has HD display! 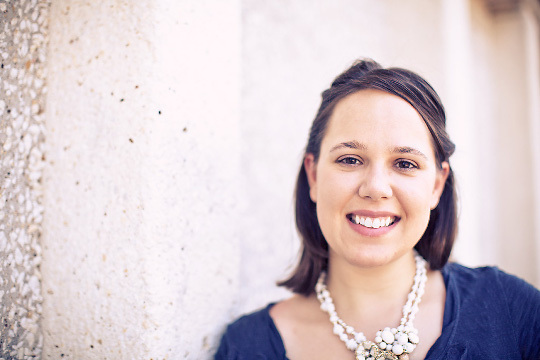 Emily was one of my favorite brides – super nice and lovely taste in invitations. Simply lovely. Emily married Cameron at the Fort Worth Japanese Gardens in an event with every detail looked too. Planned by Jordan Payne – these two had origami cranes hanging, fanciful fans to cool the guests and an exit in a petti cab. 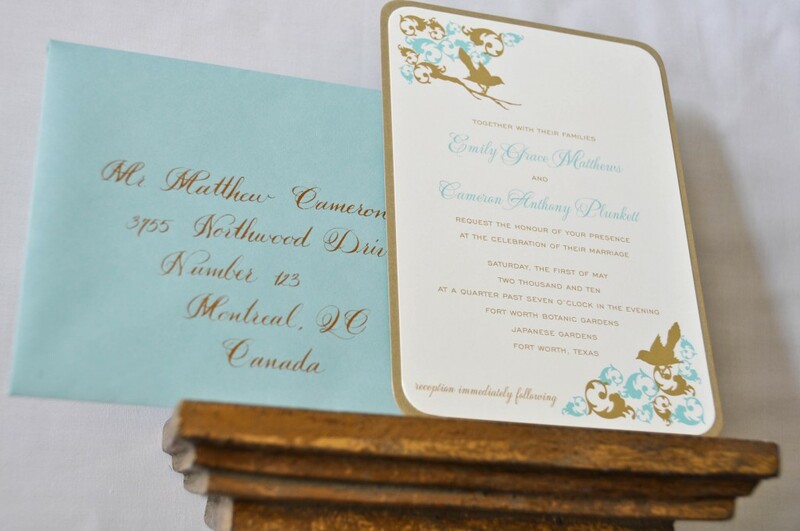 The invitations were just as lovely. 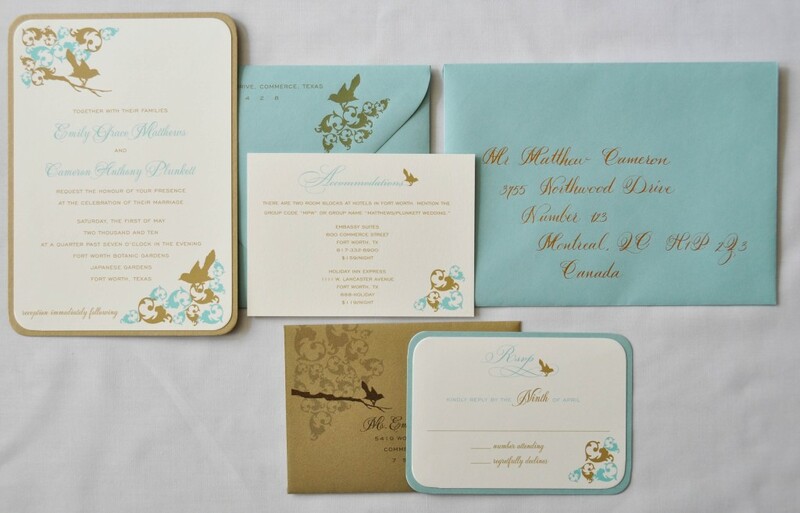 Robin’s egg blue envelopes addressed in gold with a custom font to match the invitations that had birds, layers of paper and rounded corners (love the rounded corners). A very lovely bride had me calligraphy her reception items for a may wedding. She chose to use white ink on sage paper and I must say it turned out lovely. I love the lightness of the entire set. She chose the citadel font. 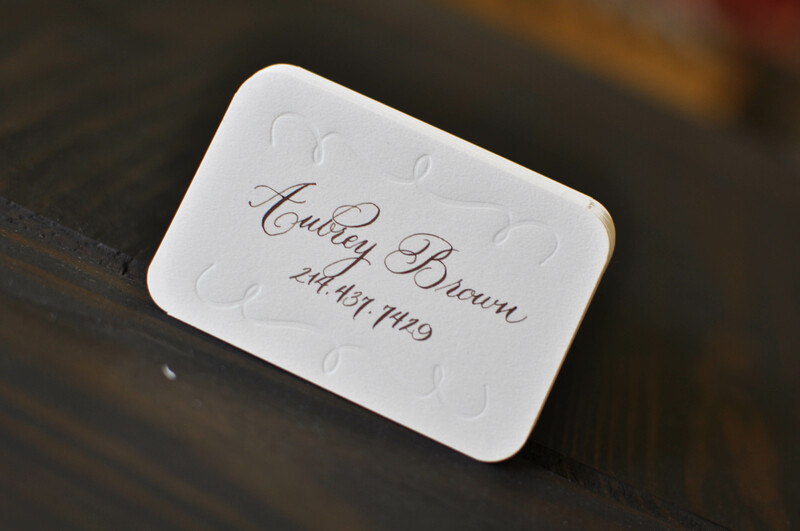 Recently I had the joy of printing/calligraphing some calling cards for a couple of friends in need. 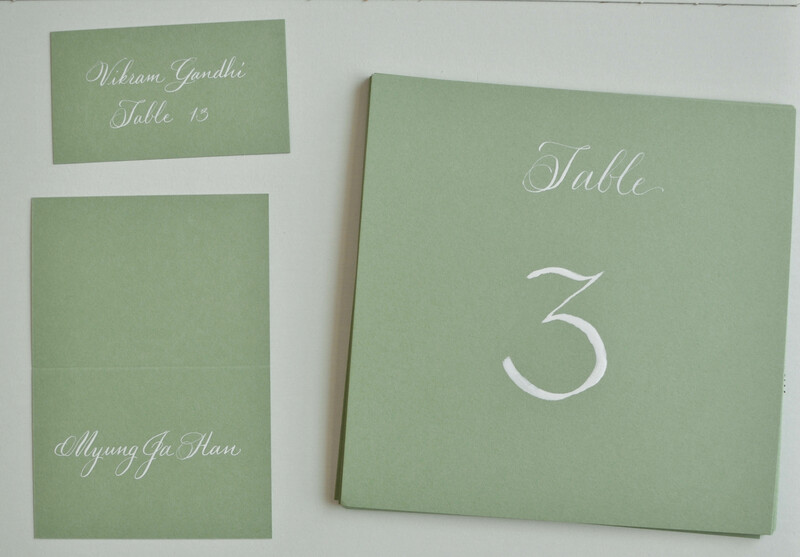 The two designs have been blind printed with calligraphic flourishes that I whipped up and the lettering is all calligraphy with a custom mix of green in the ellen font. I wanted her to have a tall card and a horizontal card for a little variety. Both are on cranes 300gsm letterpress paper. Finally, I since I am in the middle of re-branding (it’s a long process!) and my old cards were not entirely reflective of me… I created a few simple calling cards for the interim. 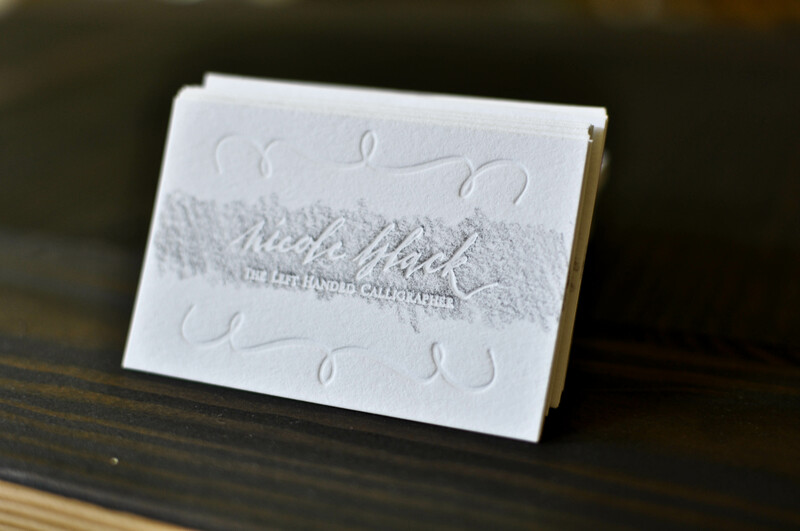 These are blind embossed on cranes 300gsm letterpress paper with my calligraphic flourish and name in the mitty font. To add a little contrast I used a black color pencil and shaded of the name and business name. Not too bad for an interim card, huh?